EVAPAR offers a number of Emission Control systems and products. Emission control is vitally important to any industrial application and with EVAPAR’s ability to help organizations control emissions, we have built a reputation for excellence and reliability. EVAPAR also has an industrial air compressor division that specializes in Atlas Copco compressors and accessories. We are your one stop source for all your service, parts and rental needs. Inquiries about our Diesel Engines and emission control products can be directed to our Evansville office. Please click here to fill out and submit a contact form. AirFlow Catalyst Systems is revolutionizing diesel exhaust emissions control with innovative technologies. Our portfolio includes a variety of products that are critical to maintaining efficient and healthy environments. 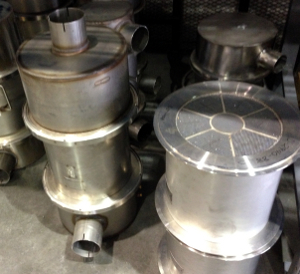 AirFlow Catalyst Systems was founded in 1997 to develop leading edge materials for catalytic converter technologies. Our focus is on low temperature applications for diesel engines. Organizational strength from our beginning has been in chemistry. A proprietary wash coat formulation based on a NASA license has been supplemented with product specific catalytic chemistry for diesel emissions control systems, including our EZCat, MinNoCat, EZDoc, and custom coatings. The low temperature performance properties of AirFlow materials provide cost savings with higher performance and lower capital requirements. Product development is managed internally in our development lab, supported with a network of external R&D facilities. At our production facility we develop commercial technology from experimental investigations. Commercial products in our portfolio include EZDocTM, EZCatTM, custom coatings, and a non-urea deNox system. The products have been field tested on engines and have shown excellent results in performance and economics. Target Market is mining applications. EZDoc has been approved by the Pennsylvania Department of Environmental Protection (PA-DEP)*. EZCat and MinNoCat have been Listed by MSHA**. Additional State certifications will be obtained on an ongoing basis. Key customers include salt mines, coal mines and commercial marine fleets. Emission Control Devices One of the most severe environments for emissions control is underground mining. Harmful emissions can quickly build up in difficult-to-ventilate mines. Our ability to control these emissions established our reputation for product and systems excellence and reliability. Today we supply the majority of worldwide original diesel equipment manufacturers for mining applications including: Atlas Copco, EIMCO, GHH, MacLean Engineering, Normet, Schopf and Volvo Construction Equipment, Oldenberg Cannon, Oldenberg Group, Dux Machinery, Mining Technologies Group, GHH, Marcotte Mining, Sandvik Tamrock/EJC Loaders, Getman, A. L. Lee, Wallace Diesel, DAPCO Inc.. Catapillar, Johnson Ind, Damascus and others. Mining vehicles normally operate underground or in poorly ventilated areas, running 24 hours a day, 7 days a week. The diesel exhaust being emitted from these vehicles is inhaled by the operators before dissipating. This is normally due to decreased air flow and poor circulation. Increased exposure to diesel exhaust: besides being a factor in heart and lung disease and a possible carcinogen, also directly affects worker health and safety. There is a direct correlation between increased exposure to diesel emissions, increased sick days, and decreased productivity. The harmful components of diesel exhaust; particulate matter (PM), carbon monoxide (CO), and hydrocarbons (HC), can be easily reduced with current and readily available technologies for immediate emissions reductions and immediate health benefits. Engine Control Systems Limited (ECS) offers three retrofit solutions designed with mining in mind; a diesel oxidation catalyst (DOC), and both a passive and active diesel particulate filter (DPF). The DOC, known commercially as the Severe Duty AZ Purifier and the Purimuffler are a proven choice for reductions of PM, CO and HC. The passive DPF known commercially as Cattrap, is offered for its extraordinary reductions of PM while not increasing NO2. The active DPF known commercially as Combifilter is offered for its ability to reduce emissions with no concern about duty cycles or exhaust temperatures. ECS retrofit technology solutions offer superior performance at maximum cost effectiveness per retrofit dollar. The products offered by Engine Control Systems go through a strict testing and validation regime. ECS holds more product certifications and verifications than our competitors and we can prove it. Letter of evaluation from agencies, testing results, and papers are readily available to our customers. Because particulate exposure increases exponentially with proximity to the source, reducing emissions with retrofit technologies in the vicinity of children provides critical public health benefits and minimizes children’s’ exposure to these harmful emissions. Engine Control Systems have global manufacturing facilities in Canada, USA, and Sweden. At ECS we offer many diverse ways to improve productivity, equipment life and worker health through our performance systems. ECS is the difference between a one-size-fits-all solution and a comfortable custom-fit. The Combifilter is an actively regenerated DPF system that typically removes 90+ % of PM* while reducing NO2 emissions. The system is comprised of an integrated DPF and silencer assembly, and an off-board regeneration control panel or station. Un-like passively regenerating DPF’s, Combifilter equipped engines do not have to meet minimum duty cycle requirements. Regardless of how you operate, a Combifilter allows certainty and peace of mind in your operation. Depending on the Combifilter™ you choose, simply plug your Combifilter™ equipped vehicle in when you’re on lunch or when the days work is done and your equipment will always be ready for a day’s uninterrupted work. AZ Purifiers and Purimufflers offer an industry leading, verified 20-40% PM (Particulate Matter) reduction* values depending upon on the application. Other manufactures offer only verified PM reduction* values of 20 to 26%. Our competitors claim to offer similar high levels of PM reduction, but only Engine Control Systems backs it up with actual EPA verification. THE BEST DOC SOLUTION IN THE INDUSTRY, PERIOD! AZ Purifiers and Purimufflers employ an advanced zeolite containing washcoat and precious metal catalyst that afford superior low temperature performance.